If I could eat Chinese food every day of the week I would be a happy camper. I just love everything about it, the seasonings, the sauces, the combination of flavors and the best part, that a lot of recipes are very easy to make. 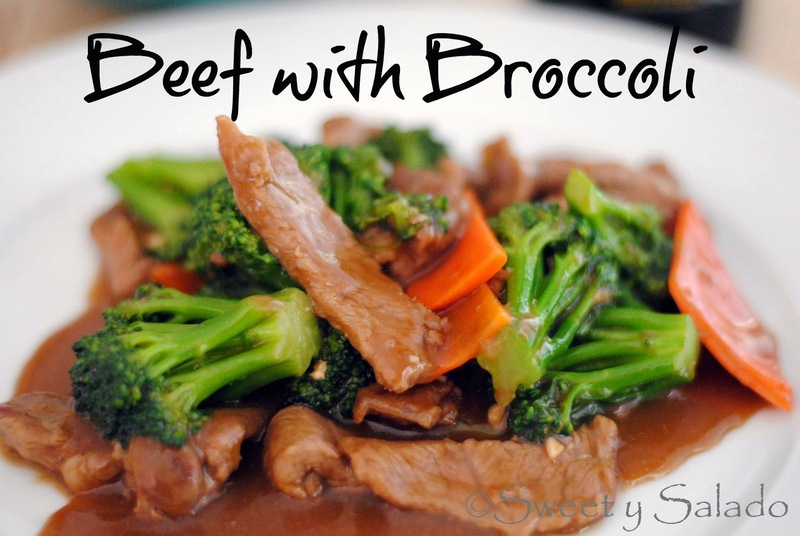 My husband on the other hand can take it or leave it, but when it comes to this beef and broccoli recipe, he always goes for seconds. I have been making all kinds of beef with broccoli recipes for many years and most of them have been pretty good but the one thing I couldn’t get right was making the beef more tender. One day I heard about a technique called “velveting” which leaves your meat super tender and not dry at all. 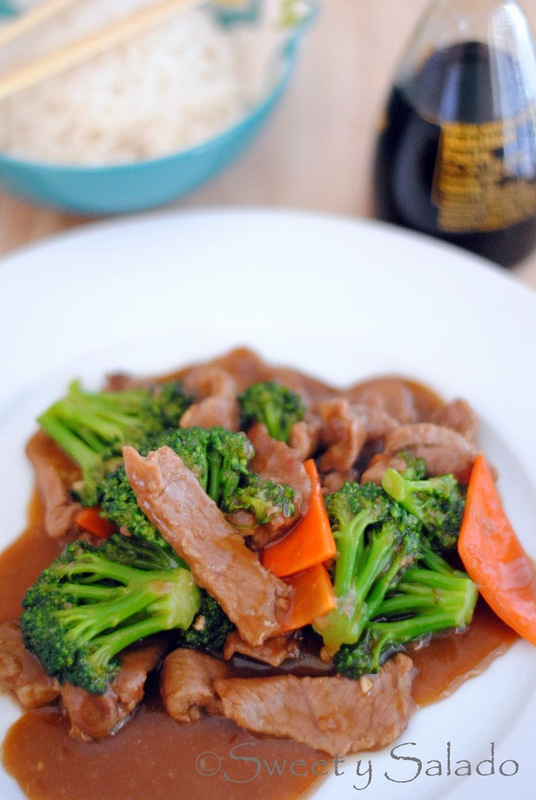 There are many ways of velveting but one of the most common ways is by marinating your meat with baking soda and cornstarch, then rinsing it and then parboiling it for a few seconds before making your stir fry. Now, that sounds lovely but parboiling my meat before making my recipe just doesn’t appeal to me at all. For one thing I don’t want to lose the flavor I’ve already infused the meat with, plus, parboiling is just it another step I simply don’t want to bother with. Call me lazy but that’s just something I don’t want to deal with. So, of course, I ended up making my own velveting lazy version and just added baking soda and cornstarch to the beef and broccoli recipe I had already come up with. The result? Super tender beef with a ton of flavor. Hope you enjoy it! 1. In a small bowl mix all of the ingredients for the marinade and set aside. 2. Place the sliced beef in a large bowl, add the marinade and mix to coat the meat well. Cover with plastic wrap and refrigerate for 30 minutes to 1 hour. 3. In the meantime, mix all of the ingredients for the sauce and set aside. 4. Uncover the beef and add 3 tbsp of cornstarch. Mix with your hands to coat it well with the cornstarch until it disappears. Set aside. 5. Parboil the broccoli in boiling water for about 1 minute. Drain and set aside. 6. Mix 1 tbsp of cornstarch with water and set aside. 7. Heat oil in a large pan or wok on medium high heat and add the beef. Cook for about 5 minutes or until the beef is almost cooked through. Add the carrots and cook for another 2 minutes. Add the broccoli and cook for another 1-2 minutes or until the broccoli is heated through. Add the sauce and stir well to coat all of the ingredients, then add the dissolved cornstarch and stir for another 30 seconds to 1 minute to let the sauce thicken. 8. Serve with white rice or noodles. Hola edwin, dado de que para esta receta solo necesitas 1 libra, entonces debes multiplicar todos los ingredientes pof 5. How should it taste like? I don’t have oysterling sauce but I’m thinking of using honey, I don’t have sesame oil I guess I can use olive oil, and I don’t have sherry maybe I can use apple cider. What do you think? Oyster sauce has some sweet undertones but it is mainly salty, so honey would not be good substitute. If you can’t find it, it’s best to omit it completely. Same with sesame oil, which is mainly used to add some depth to flavor. You could substitute the dry sherry with apple cider vinegar.